It seems like Google is doing some testing with its Search engine, after the Matt Cutts controversial statement there is new news coming from Google that they are displaying only 7 search results in their search engine. Moreover, these 7 search results would be related to only one website that will dominate the whole page. This doesn’t means that Google is kicking out 10 search results because they will continue to show ten results under certain conditions. Few weeks ago we received quite a few emails from our followers that Google is showing 7-results in its search engine. So, here is the screenshot which will clear everything that how this whole thing works. The Following Screenshot is obtained by Searching “My Blogger Lab” (Exactly) in the Google search. From the above screenshot, this thing is quite cleared that you will only see 7-results with SiteLinks of a certain website. 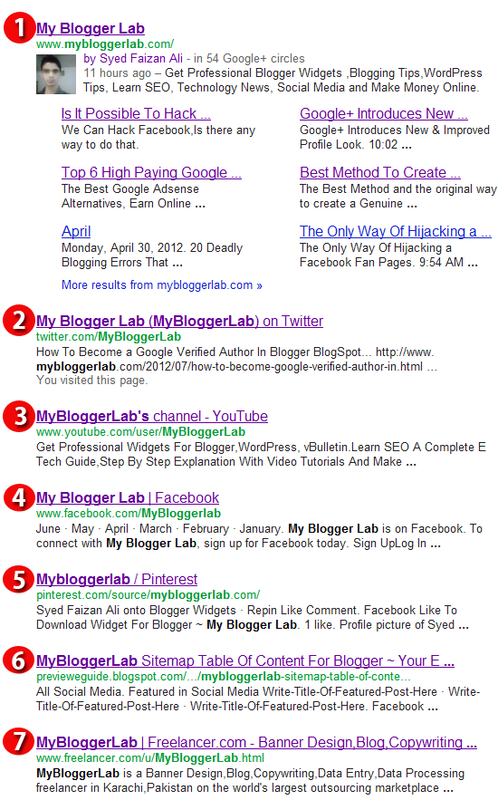 For example, here we have searched “My Blogger Lab” and it has provided 7 results related to the same blog. Why You are Unable To See SITELINKS and 7-Results of Your Website in Google? This is quite clear that Google is testing its functionality, so you may remain unable to witness 7-results of your website in Search because only 20% websites has been blessed with Google’s new improvement in Search results. If you are thinking that it is latest addition in Google Search then you may get surprised because 7 search results are showing for some websites from the start of 2012. However, Google has increased the number of website that can have the SITELINKS along with 7-Results. Following Graphics is obtained from SEOMOZ which shows the percentage of website that are blessed with 7-Results. You will quickly notice two things: (1) “My Blogger Lab” is a brand, and (2) the #1 link is expanded with SiteLinks. Though, it will not going to show SiteLinks along with 7-results for every searched keyword. For example, Search for “MS Works” and 1st result is of Wikipedia but the entry page doesn’t relate it. Moreover, we have 10 results instead of 7. So, it is quite clear that the 7-results will only appear if we search the name of specific brand like EBay, Wikipedia and etc. Not every SERP will appear like a brand though few set of keywords will show them. However, if you are thinking that SiteLinks is the reason of showing 7-results for a specific brand, then you are bang on target. 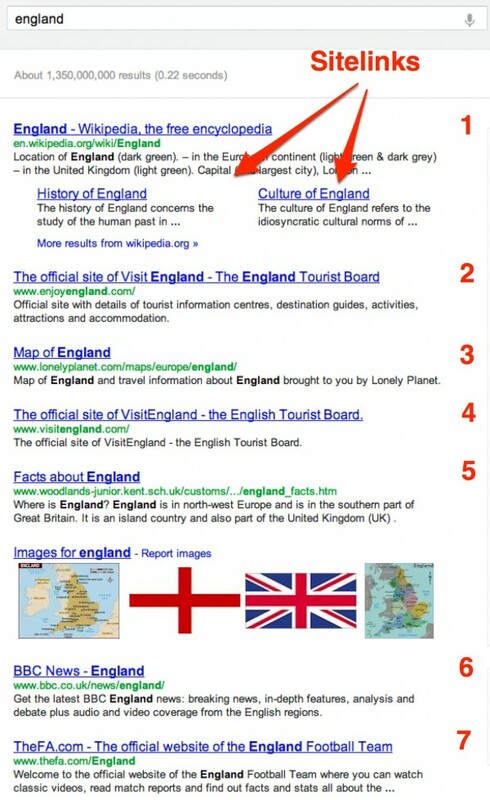 For Example, let us search “England” in Google search engine, and you will see SiteLinks from Wikipedia along with 7-results in SERP. Google dispatched a comment to Search Engine Land: "We’re continuously trying our best to show multiple results for a single website so users can show interest in that site. Separately, we are also experimenting with number of results on every page, which will continue periodically. Altogether our goal is to provide extra ordinary results for a specific query as quickly as possible. There’s always room for improvement.”. There is a lot going around these days and specially on Google.com. The 7-results will be a splendid thing to watch because it will allow a single website to dominate the whole page. We will keep you updated on latest trends and news- that could benefits you as well as us. Give your suggestions about Google’s latest addition to Google SERP, do you feel it will going to benefit, or another one will bite the dust till then peace, blessings, and Happy Googling.